© 1998 - 2019 The Vox Showroom, all rights reserved. No use on online auctions, eBay or Reverb. The Vox VT Series was introduced in the fall of 2010. The VT+ Series replaced the Vox Valvetronix VT Series of amps that had been introduced in 2008. The VT+ product line included four combo amps; the VT20+, VT40+, VT80+, and VT120+. The VT+ Series amps are the same size and weight as the previous VT models but include a significant number of cosmetic and electronic improvements. Cosmetically, the chrome plated steel grills used on both the AD and VT Series have been replaced with a black fabric Vox grill with "shadow dianonds." A chrome "T" molding fascia divides the upper, vinyl covered portion of the front panel from the lower, grill covered area. No white piping is used around the grill. A chrome -V-O-X- logo and Valvetronix model flag also adorn the grill. The VT Plus amps benefit from about a 20% boost in output power over the prior models. Despite this increase in RMS output power, the VT+ Series retains the same retail pricing as the previous VT Series models. The hybrid tube/solid state Valve Reactor power amp stage was carried over from the VT to the VT+ Series, but the VT+ Series control functions are a totally new design. The Valve Reactor power amp section of all four models of the VT Plus series uses the patented Vox Valvetronix Valve Reactor circuit. The concept of the circuit is to use a 12AX7 preamp tube in an unusual way - as the heart of a one watt power amp. This one watt power amp even includes a small output transformer to simulate the electronic interactions that happen in high powered tube output circuit. 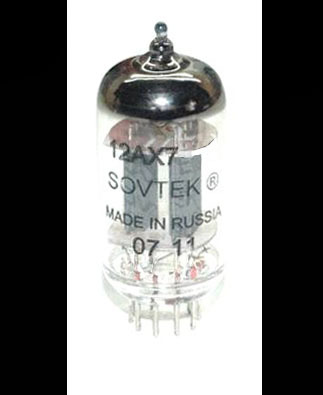 The one watt output from this 12AX7 is then passed to a totally transparent solid state power amp to achieve the final 20 watt (VT20+), 40 watt (VT40+), 80 watt (VT80+), or 120 watt (VT120+) output. The circuitry for the preamp, or control section of the VT+ Series was derived from Korg's REMS (Resonant structure and Electronic circuit Modeling System) guitar effects processors. A number of significant improvements and new features were incorporated into the VT+ Series when compared to the prior Valvetronix models. AMP MODELS: The VT+ Series increased the number of selectable amp models from 22 in the previous model to 33. What is an amp model? By simply adjusting a few controls, one can select one of three variations from from the tone of eleven of the world's most popular amplifiers. A rotary amp model selector offers eleven choices of amp models while a push button toggles between "Standard," "Special," and "Custom" tonal variations of the chosen model. PRESETS: Ninety-nine factory preset tone programs are included in the VT+ Series amp. These are organized into three banks of thirty-three programs . Bank One has thirty-three programs that are spot-on recreations of the sounds used on classic tracks. Bank Two includes thirty-three programs described by Vox as "Vox Valvetronix tone at it's finest." Bank Three has thirty-three programs that utilize the digital effects in the amp. PROGRAMMER: The Programmer provides eight "User Programs" for storing and saving your favorite custom amp settings. TUNER: A digital guitar tuner with mute function is included. TONE PEDALS: The circuitry of eleven popular tone effects pedals are built into the amp. A level control adjusts the final output of the effect. MODULATION/DELAY PEDALS: The circuitry of eleven modulation or delay effects are also included in the VT+ amplifiers. REVERB: Three digitally simulated types of reverb are available from a single rotary control. The first third of the sweep of the control (Room) offers the natural reverb duration one would expect of a mid sized room. The middle sweep of the control (Spring) offers tradtional spring based reverb tones. The last third of the sweep of the reverb control (Hall) offers a the large and long reverb tone one would expect in an auditorium. 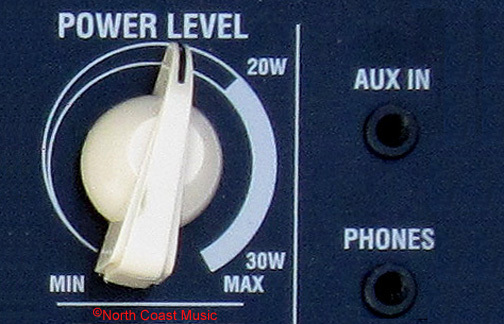 POWER LEVEL CONTROL: This continuously variable control allows the total output power of the amp to be adjusted from one watt to the total output power of the amp. AUX IN: Connect an MP3 or other external audio source into the amp using this 1/8" input jack. PHONES: Connect head phones (not included) into this jack for silent practice. Using this jack mutes the speaker. An optional VFS5 five button foot switch allows for remote switching of effects and programs. Vox specialist dealer North Coast Music offers the Vox VT20+, VT40+, VT80+ and VT120+ with an aftermarket retrofit to traditional brown or black diamond Vox grill cloth, along with white grill pipng and gold "T" bar. Click here to go to the New Vox Amps web page at North Coast Music.